of the best sport fishing you can experience anywhere on earth. Los Roques offers some of the best deep water fishing in the world, just 30 minutes from shore. Fishing is so great off the coast of Los Roques because the clean, nutrient rich, underwater surroundings provide shelter and food to a host of small fish that attract large fish like Barracuda, Blue Marlin and White Marlin, Sail Fish, Tuna, and more more. the world because of the warm weather, beautiful scenery, and clear blue water that dramatically changes shades of blue as you go deeper out to sea. Los Roques fishermen (and women!) enjoys air temperatures in the upper 80s to low 90s (26º to 32 Celsius) Farenheit, and a water temperature that stays about 76º Fahrenheit (about 24º Celcius) year round. Combine that with the trade-winds that provide a nice breeze throughout the day, and you have a perfect location to enjoy bonefishing in paraside. A bonefish (also known as Albula vulpes) is a type of fish from the Albulidae family. Bonefish live in tropical waters and travel in schools as they migrate to shallow mudflats all around the Los Roques Archipelago to feed as the tides comes in each day, then head back out to deeper water as the tide receeds. 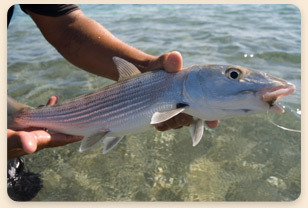 Bonefish weigh up to 22 pounds (10 kilograms) and reach a length of about 40 inches (104 centimeters). Bonefishing method is having a guide take you to the schools using a pole to push the boat, because motors scare the Bonefish away. Once the boat’s guide finds the Bonefish, they’ll help tell the Angler where to cast his line for the best chance at hooking a Bonefish. 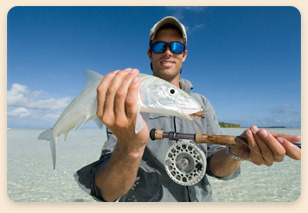 If you want to have the most fun bonefishing experience while in Los Roques, we recommend that you hire a great guide. A bonefishing guide will help you find the best spots to fish, teach you the right techniques, and help you get ready to successfully catch bonefish.